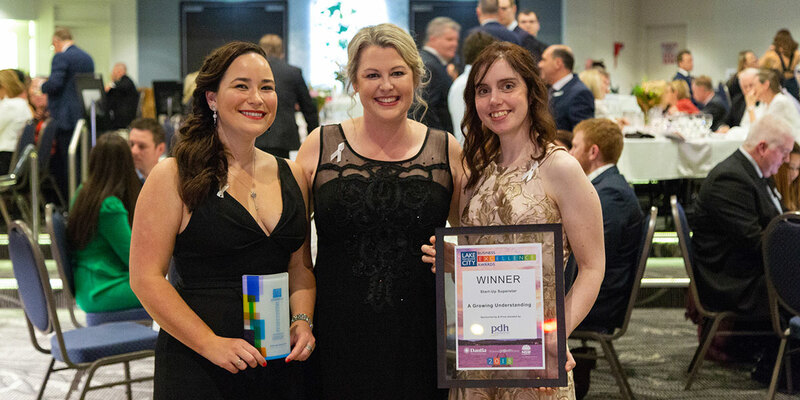 A Growing Understanding Speech Pathology has been recognised for our individualised service and passionate approach at the 2018 Lake Macquarie Business Excellence Awards. We were honoured to be recognised amongst other outstanding business when we were announced the winners of the Start Up Superstar award at the recent awards ceremony, held at Belmont 16s. A Growing Understanding Speech Pathology has always been about supporting and helping children develop essential skills. It is truly uplifting to know our work is not only making a difference to the families we help every day, but that we are contributing to the Lake Macquarie business community as a valuable start up. I have always believed that a child’s growth is founded in understanding – Their understanding of the world in which they live. Our understanding, as parents, educators and speech pathologists, of their abilities, their needs and how they relate to the world around them. It is this belief that drove me to establish A Growing Understanding Speech Pathology where emphasis is placed on education and coaching to ensure families learn lifelong communication skills and build confidence. When the practice opened in 2016, I was the sole clinician with minimal appointments each week. This wonderful award has reminded me of the growth we have achieved in just two years. Within that time the practice has grown significantly, thanks to the support of the wonderful families we work with every day. I am honoured to continue on our path with passionate professionals like Melissa and Jess, and we can’t wait to share our expertise and skills with Port Stephens families when we open our new practice in Williamtown in August. The passion for what we do and how we help families grows every day, and as a winning start up business, we are always on the lookout for new ways to support our industry and ensure the continued delivery of quality, evidence based care.